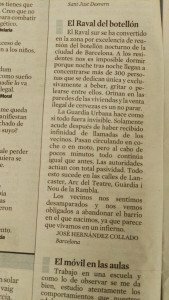 A letter to the the Catalan daily La Vanguardia highlights the plight of residents disturbed by nocturnal revelry on some streets of Barcelona’s Raval district. “For us residents it’s impossible to sleep because night after night more than 300 people gather [in the street] and do nothing but drink, shout or fight amongst themselves,” writes a local resident called José Hernández in a letter to the editor last Sunday. He was complaining about something known is Spain as a “botellón”, which is basically a big booze up in the street. Young revellers bring their own alcohol to avoid spending money in bars. It happens all over Spain. “They urinate against the walls of houses and the illegal sale of beer never stops,” he continues. 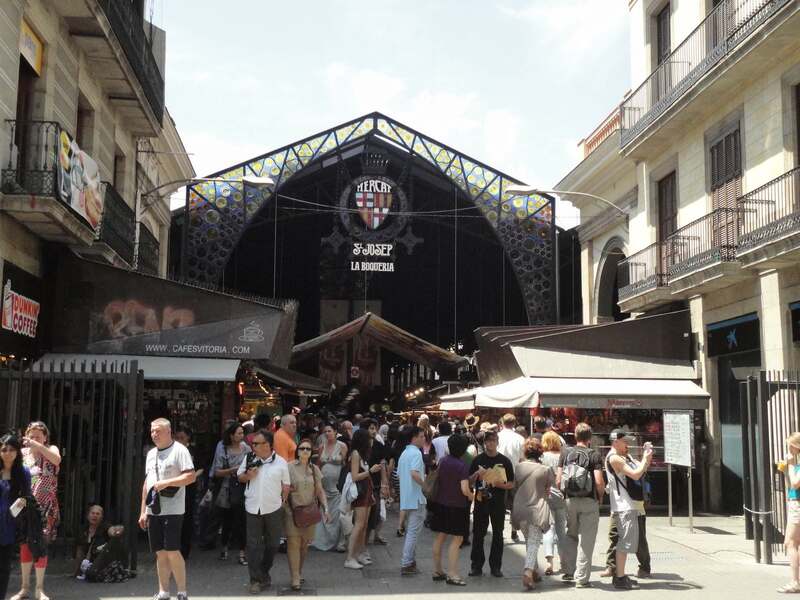 Apparently the problem is concentrated on certain streets in the Raval, namely the calles Lancaster, Arc del Teatre, Guàrdia and Nou de La Rambla, all towards the bottom of the Raval near Las Ramblas. “We residents feel helpless and are being forced to abandon the neighbourhood where we were born, as it seems we are living in hell,” he ends. Barcelona’s Raval district is centrally located close to many of the cities main attractions, and some parts of it have lots of character. House prices there are also attractive, but by the sounds of things, it might be worth avoiding those streets if you are looking at property in Barcelona. I know the feeling. Here in central Valencia, a recent pedestrianisation of plaza Mercado and calle Bolseria has resulted in all traffic, including the regular (every 5-6 minutes) 81 bus and all the tour buses, going up c/de la Carda past Hostal el Rincón. That’s bad enough but what’s worse is that the pedestrian areas at the junction are now part of the playground for customers of the bars there. One is called ‘London Café’. There’s absolutely nothing London or English about this place other than some plastic repro street name signs and framed enlargements pages from the A-Z (why Willesden?) but it attracts Brits. Sadly, you can guess the rest. I’ve been coming to Hostal el Rincónfor 15 years. One of its attractions was that, although so centrally located, it was remarkably quiet at night. Now there is a street party all night long 50m from my room. This stay will be my last, not because I’m giving up on the place but because since Jan I have a flat 5 minutes walk away. My building is on the corner of two pedestrian streets, with no bars within hearing. My flat is ‘para reformar’ – and then some – but when finished it will be a haven of that remarkable and rare thing in Spanish city central barrios – peace and quiet.